The wonderful Debbie from debelloyd.com nominated me ages ago for the Sunshine Award, which is very sweet considering my dreadful absence last month! Her blog is full of cool things and I especially love her artwork – such a talented lady! 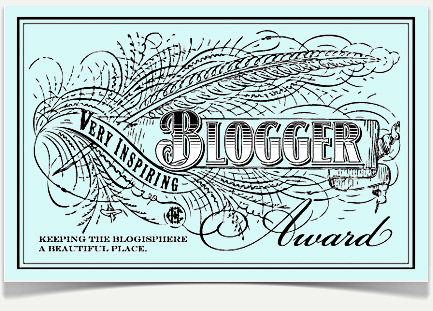 The lovely Sheen over at Golden and Sheen nominated me for an award last week – the Very Inspiring Blogger Award. I’m aware I’ve not been too inspiring lately, what with all my huge absence, but nonetheless I’m very flattered, especially since I think she’s so awesome. We met at a blogger meetup earlier this year, and got on really well, so definitely go and check out her blog! Thanks Sheen! A New Liebster Award Nomination! It’s been a good couple of weeks for me, blogging-wise, and I’m really feeling the love from all you lovely readers. Last week I was nominated for a Liebster Award by Bridgett of Bridgett’s Beauty Blog. She does lovely reviews (self-described as ‘brutally honest’!) and I always enjoy reading her posts, so check her out!